With this prompt journal, document the flavors and effects of different types of cannabis in your recipes. The cookbooks you inherited from your grandmother have handwritten recipe notes like, "bake 5 mins less" and "double amt of ginger." 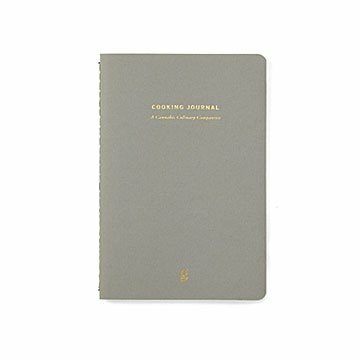 This journal has guided entry pages for documenting the flavors, effects, and experiences of an ingredient that wasn't legal back then. With so many variables in both kitchens and cannabis, small changes can make a big difference. Keep track of them all so you can repeat wins, avoid fails, and understand your body's (and palate's) reactions to different strains and types. Years from now, when your grandchildren read this, they'll think of you fondly when they see, "OG Kush - flavor too strong for hummus" and "Mendocino Purps - great in granola." Made in Tennessee.